What’s so special about natural goats milk soap? This is a question we hear almost every week in our shop, and we can guarantee that anyone who asks has never tried using a handmade aromatherapy goats milk soap before. We’ll try to explain why we think our handmade natural goats milk soap is really special. Goats milk soap is more difficult to make than a typical handmade bar, since the milk affects the cold process saponification process. We use real goats milk (not powdered) to make our handmade soaps since it contains proteins, amino acids and Vitamin A to nourish and soften the skin. You may read some articles which claim that natural goats milk soap has the same pH as the skin. We’d disagree with these claims since handmade cold process soap is naturally alkaline, so it’s doubtful if a natural soap could become slightly acidic without the addition of chemicals. Nevertheless, the goats milk within our handmade natural soap formulation really makes a difference, giving our soaps a superior lather with extra moisturizing benefits. 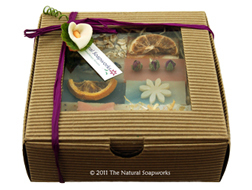 Our completley natural formulation was created after years of perfecting our soap recipe. The brief was to create a hard, long-lasting handmade bar with a rich, creamy lather whilst being highly moisturizing and skin-kind too. We’d be the first to admit that we’re perfectionists when it comes to our products, and that’s why it took so long to create our recipe! Only once we were sure that it was perfect, did we launch the first few bars of goats milk soap. Not surprisingly they began to out-sell our other handmade soaps to the point that we stopped making the old varieties. These days we only make milk enriched soaps – mainly goats milk soaps, but also some special edition coconut milk soaps for our vegan customers. It’s no accident that our soap contains a blend of many botanical oils and butters, and these have been carefully balanced to produce the rich texture and foaming qualities we were looking for. We also use a cold-process saponification manufacturing process and use traditional handmade wooden moulds. Each new soap is matured for 4-8 weeks so it hardens and becomes mild before it is presented for sale. So the next time you try a new natural soap remember that each recipe will be different, since the skilled soap maker crafts their recipe to produce particular results. So what can you expect from a handmade Natural Soapworks goats milk soap? The first thing people always do, is give the bar a sniff! Fragranced with pure essential oils, each soap variety has its own special character, and this adds to the pleasure of using the soap each day. We also love pretty soaps, so we use natural clays and spices to add a little colour to most varieties. We often swirl these natural colours through the soap so each bar has quite unique patterns. The goats milk gives the soap a unique, creamy lather that’s so rich that it can be used for shaving or as a natural body wash. The soap suits delicate skin conditions, and people who visit our shop are often invited to try washing their hands before making a purchase. Most people are impressed by the conditioning feel of the lather, and everyone comments on how soft their skin feels after just one wash. So we’d sum up our handmade goats milk soaps as being naturally pretty and fragrant, but very functional and full of top quality ingredients. So are you tempted to give handmade goats milk soap a try? Why not visit our Goats Milk Soap page for more details. We also have Handmade Soap Gift Sets, and even produce personalised soaps if you want to send a special message to someone!